a few days ago it was 70 degrees, kids running around in short sleeve shirts and enjoying the sunshine! Today we woke up to over 4 inches of snow!!! favorite picture of the day! 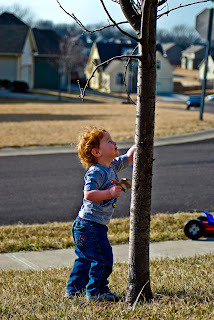 Teagan found a leaf on the ground and was determined to put it where it belongs; back up on the tree!!! I upgraded to a Nikon D80! Loving it so far! ( I just wish my skill level was up to par) I am hoping to get a few new lenses for it in the near future....here are some pics I took with it. The weekend was sunny, but still cold. Kids are really starting to get spring fever! Everyone is tired of being cooped up inside. 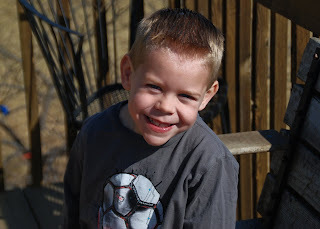 We played outside for a little while on Saturday!